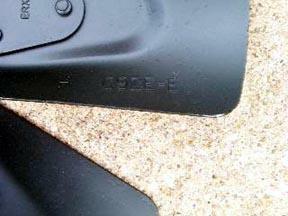 Ford radiator cooling fans are identified by basic part number 8600. During the course of 1968 - 1970 Mustang production there were several different fans used to keep our Cobra Jets cool. All were driven directly by a pulley attached to the front of the cast-iron water pump; electric fans were not used. Both fixed-pitch and flex fans were used depending on cooling needs, often dictated by the presence of air conditioning. 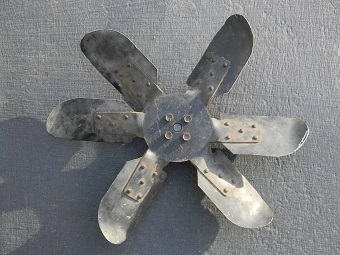 All of the fixed-pitch fans were built using a stamped steel center section and aluminum blades that were attached to the center section with rivets. 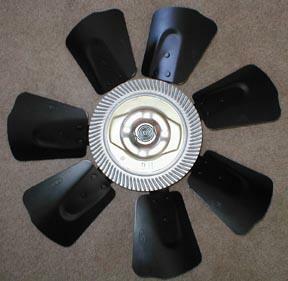 Flex fans were built using flexible spring steel blades. 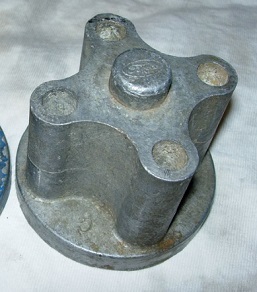 Small washers under the rivet heads were often used to balance the assembly. 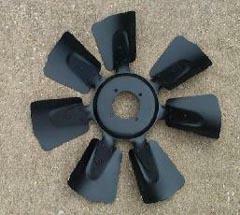 Fixed-pitch fans typically came equipped with a fan clutch that allows the fan to free-wheel a bit when not explicitly needed. The original black paint was applied by dipping, so runs and other imperfections should be quite common. Here's a table of confirmed applications by year according to examination of original build sheets and member input. Examples of both types of fan are included below. We've also seen a Mercury Master Parts Catalog reference to a six-blade, 18.00" flex fan used on 1969 SCJ Cougars with engineering number C9OE-G (which was replaced by the C9OE-H (service part number C9OZ-8600-D) fan in November 1968). We've seen two build sheets that document this fan being installed on an SCJ Mustang with scheduled build dates of September 13 and 18, 1968. The C9OE-H build sheets that we've seen have December 1968, January 1969, and September 1969 (that's in the 1970 model year), build dates, though we've also seen build sheets with C9ZE-E fans used later in the 1969 model year. The January 1969 C9OE-H build sheet is for a 1969 V-code SCJ Mustang. 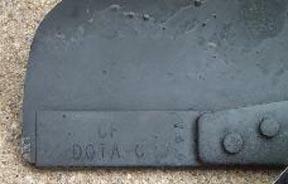 We've seen a reference to a change-over date of 1 September 1969 for moving from the C9ZE-E fan to the D0TA-C fan. However, we've seen several build sheets for 1970 Mustangs built after September 1st with 428 CJ and air conditioning that used a C9ZE-E fan! We believe that 1970 Mustangs with 428 CJ and air conditioning continued to use the C9ZE-E fan throughout the model year. We're very interested in seeing any build sheets that might prove otherwise. Needless to say, this is one of the research areas where build sheets are very helpful because the build sheet clearly identifies the fan originally installed on your Mustang. If you have a copy of the build sheet for your car, please consider sharing a copy to assist with our research efforts. The C8OE-B fan was used on 1968 Mustangs and Shelbys. It actually looks a lot like the later C9ZE-E fan. We've heard that the C8OE-B fan might have been used on 1969 Mustangs, but we've seen no evidence to confirm such claims. The C9ZE-E fan (shown above) appears to have been used on most 1969 CJs and SCJs. This fan requires a fan clutch. Build sheet analysis suggests that the C9ZE-E fan was used a 1969 V-code SCJs starting some time in April, 1969, and was used through the end of model year production. 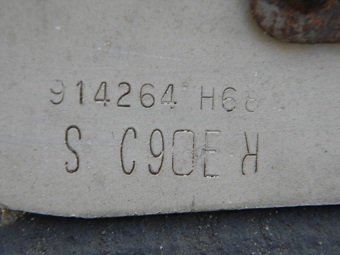 Build sheet analysis suggests that the C9OE-H fan was used a 1969 V-code SCJs through March, 1969. 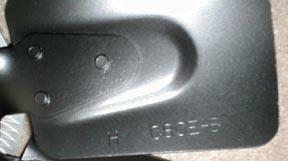 We've seen two different representations of the engineering number stamped on the C9OE-H fan. One variant (dated August 1968) includes an "H" that looks like an upside down "R". A later variant (dated January 1969) includes a more normal looking "H". Both variants are shown below. The D0TA-C fan is a variable-pitch "flex" fan that adjusts air flow automatically by flexing the fan blades as engine RPM increases. According to the 1970 Ford service manual, "this fan adjusts itself to the engine cooling requirements without the use of complicated variable speed drive mechanisms". In other words, no fan clutch required. However, an aluminum spacer is required to mount both this fan and the C9OE-H fan and maintain proper radiator clearance. Spacer identification information can be found below. 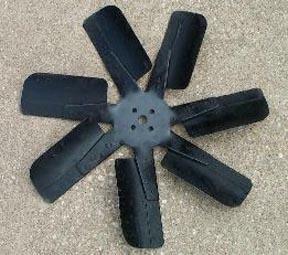 The D0TA-C fan is pictured below. The ECZ-E factory-installed fan spacer (shown below at left) differs from the C8YE-A service replacement part (shown below at right). 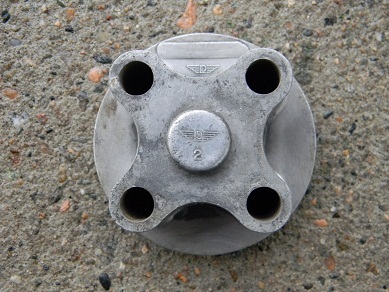 Sometimes referred to as the "winged" spacer, the factory part is marked with the winged logo of Dorman Products, Inc. and no engineering number is present. 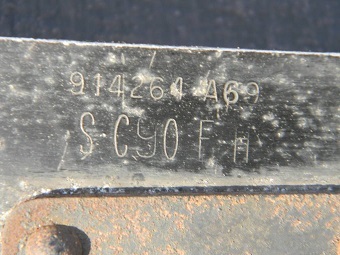 The later service part is marked with an engineering number and the oval Ford logo. 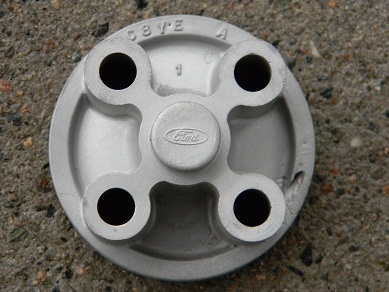 The hub of the C8YE-A spacer is approximately 0.2" taller than the original Dorman part.The measurements listed in the table above are taken from the bottom of the spacer to the fan mounting flange. We've seen two variants of the C8AE-C spacer, with one having a thinner center section than the other and slightly different markings. 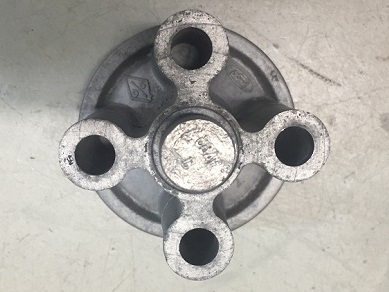 The "thin" center version is marked with "C8AE C" on the center hub. The "thick" center version is marked with a "C" on the base. We believe the "thick" center version was the factory-installed part based on observations of known original cars. Thanks to Peter Disher, Mike Bellaire, Dale McVicker, and Rick Thompson for sharing some of the pictures used here.